As a Seeker, Quin will fight beside her two closest companions, Shinobu and John, to protect the weak and the wronged. Together they will stand for light in a shadowy world. And she'll be with the boy she loves--who's also her best friend. But the night Quin takes her Oath, everything changes. Being a Seeker is not what she thought. Her family is not what she thought. Even the boy she loves is not who she thought. And now it's too late to walk away. 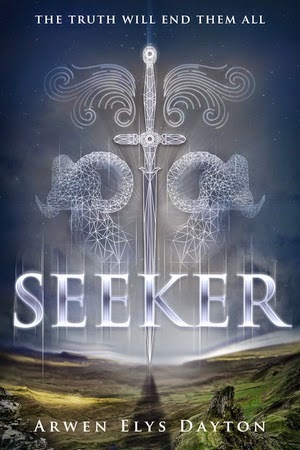 Seeker by Arwen Elys Dayton is a recommended start to a new series for younger YA readers. It's not recommended for adult readers. Three teens, Quin Kincaid, Shinobu MacBain, and John Hart, have been training on a Scottish estate for years to be Seekers by Quin's father, Briac Kincaid. A Seeker is supposed to use their training for the good of humankind and all the teens have been told it is a noble calling. They have had extensive training to fight with the whipsword, and to avoid the dreaded disruptor. They are told the secrets to using the athame, a stone dagger that can slice through time and transport the user to almost any destination. When they are finally ready to take the oath of a Seeker, they learn that John won't be included. John, however, is harboring a secret of his own. He needs to bring down Briac and take back his family's stolen athame. Once they have taken their oath, Quin and Shinobu learn the bitter truth: what they are required to do by Briac is not honorable work. The two take advantage of a destructive raid on the Kincaid estate by John and his forces and escape to another time and place in Hong Kong. But John still wants his family's athame back and he won't stop looking for it and Quin. I think a YA reader will be satisfied by the action, the deceptions, the conflicting loyalties of the teens, the rather oblique love triangle, and the complicated, emotional family loyalties. While I think a younger reader, 14, will enjoy this new series, I'll have to admit that it was a struggle for me to finish it. The worldbuilding is somewhat lacking and Dayton never establishes her settings clearly for the reader. The background information on a Seeker was incomplete. The writing felt disjointed to me. BUT, I am sure that all the points that make it a not recommended novel for me, an adult well above the targeted age range, will likely not matter at all to a 14 year old reader. Disclosure: My Kindle edition was courtesy of Random House Children's Books for review purposes.